That is that from Europe for this evening. Real Madrid joy, Barcelona misery and more Juventus frustration. Until next time, I bid you farewell. A brilliant night for Real Madrid then. They do their job in Bilbao while Barcelona crash to a stunning 4-1 defeat to Celta Vigo. Read that report here. Entering three minutes of injury time. Will Real hold on? Inter continue their perfect start to the Serie A season with a 1-0 win home win over Verona. More misery for Juventus though as they concede a late goal at home to Frosinone. Good stop from Real's Keylor Navas as he turns Raul Garcia's looping header over. It just isn't Cristiano Ronaldo's night. He beats a couple of Athletic defenders as though they aren't there but, with just goalkeeper to beat, he drags a shot tamely wide. Into the last six minutes. The hosts are pushing for a second leveller. Athletic are still a threat as we enter the last 10 minutes. A free-kick is pumped into the penalty area and Raul Garcia prods the ball wide with an outstretched foot. It's that man Aritz Aduriz again as his volley on the stretch is saved low down by Real goalkeeper Keylor Navas. Luka Modric plays a sublime reverse pass to send Isco clear down the right. He crosses low and Karim Benzema just beats Cristiano Ronaldo to the ball to tap home. A crazy night gets a little bit crazier as Sabin Merino scores his first goal for Athletic with a diving header. Anyone's game now. Aritz Aduriz is causing Real Madrid lots of problems., This time the forward is just unable to create space inside the penalty area. Athletic are furious. They are adamant Aritz Aduriz's powerful volley hits Pepe on the hand inside the penalty area. Play is waved on and rightly so as that strikes his back. Marcelo sends in a hopeful cross towards Cristiano Ronaldo at the far post. He loses out and the ball deflects of him for a goal kick. Real Madrid are on top. Karim Benzema has a shooting chance but he dallies and his effort is deflected over. Keylor Navas is about 24 minutes away from making the best La Liga start for a Real Madrid goalkeeper without conceding. Borussia Dortmund's 11-match winning start to the season is over as they draw with Hoffenheim. Not much to shout about in Italy... Just into the second half. Luis Enrique suffers his worst La liga defeat as a Barcelona boss. Lionel Messi curls a free-kick over the bar as they enter two minutes of injury time. Celta will be top of La liga for an hour. A brilliant save at either end. First Real goalkeeper Keylor Navas keeps out Aritz Aduriz's header, before Mateo Kovacic is denied a Real second by goalkeeper Gorka Iraizoz. An open match. Wow. Driving run down the right from Hugo Mallo. His cross is controlled by Celta sub and ex-Manchester City striker John Guidetti, before he calmly dispatches the ball into the net. Celta are in dream world. Neymar wakes from his slumbers to brilliantly control Lionel Messi's through ball before driving home from an angle. Into the last 10 minutes. They can't can they? Time is ticking for Barca. Andres Iniesta whips in a cross from the right but Dani Alves never looks like scoring as he puts a header over the bar. Raul Garcia kicks the post in frustration as the Bilbao midfielder sees his close-range goal bound shot deflected wide. Barcelona are piling forward for a goal to give them hope but it is Celta Vigo looking the more dangerous on the break. Barca have been shocking defensively. Real Madrid are on top. A quick break, started by Cristiano Ronaldo, ends with Toni Kroos bending a shot over the bar from Karim Benzema's pull back. What a gift for Real Madrid. Goalkeeper Gorka Iraizoz passes the ball short to Mikel San Jose. The midfielder leaves his back pass short and Karim Benzema steals in to tap home. Awful from the hosts. Celta goalkeeper Sergio Alvarez is having an inspired evening as he keeps out Rafinha's strike. Seconds later, Nolito is sent through a non existent Barcelona defence but he slides the ball inches wide. It should be 4-0. It's quite even at Bilbao, where neither side have managed to create too much. Will the score from Barca have filtered through to Real? A classic breakaway goal. Iago Aspas races clear of the Barcelona defence, he has ages to think about what to do next, but doesn't dally and slots the ball into the corner. His second of the game. Barca striker Luis Suarez is just standing there shaking his head. Incredible. Seconds later Lionel Messi is sent through and his shot is parried away by goalkeeper Sergio Alvarez. Lionel Messi doesn't miss those... yes he does. Brilliant from Andres Iniesta as he drives into the penalty area and squares for Messi. The Argentine has half the goal empty but he side foots against the post and Iniesta is unable to convert the rebound. That is inches away from a third. Iago Aspas outsprints a hesitant Barca defence. He is through on goal but, this time, he slides his shot inches wide of the post. That would surely have been game over? Real Madrid break but Karim Benzema drags wide of the far post. Athletic Bilbao are up for this as Aritz Aduriz goes close. At the other end, Iso looks set to volley home until Karim Benzema takes the ball of his foot. Open start. Celta fans hum the theme tune of the A-team - not sure why - as the game gets going. They love it when a plan comes together. Athletic Bilbao XI: Iraizoz, De Marcos, Etxeita, Laporte, Balenziaga, San José, BeNat, RaUl García, Susaeta, Sabin Merino y Aduriz. Real Madrid XI: Keylor Navas; Carvajal, Pepe, Varane, Marcelo; Kovacic, Kroos, Modrić; Isco, Cristiano, Benzema. A Barcelona defeat coupled with a Real win, would send the latter top of La Liga. Game on. The Bilbao fans are bouncing. They can sniff an upset, kick-off in a couple of minutes. Navas will break Iker Casillas’ club record for the longest start to a season without conceding a goal if he keeps out Athletic in the opening 10 minutes. Cristiano Ronaldo loves a record doesn't he? 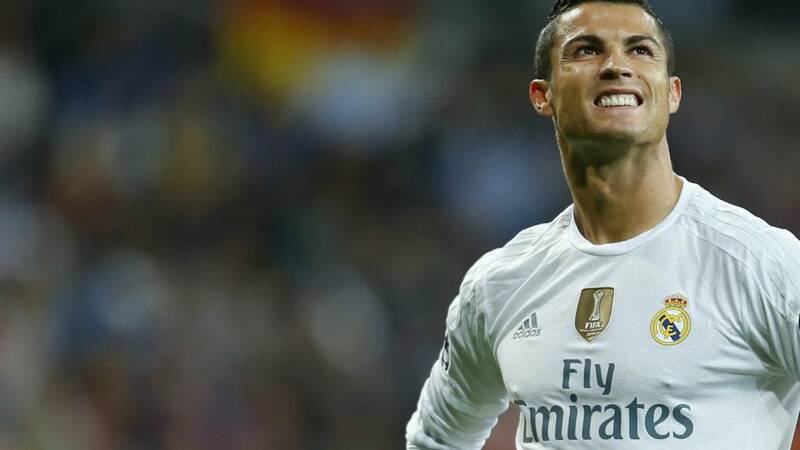 His 321 goals for Real have come in just 305 appearances. It took Raul 741 games to reach 323 goals. Real Madrid will be licking their lips at Barcelona's half-time score... They kick off at Athletic Bilbao in 10 minutes time and we will bring you all the action as it happens. Is Borussia Dortmund's 11-match winning run coming to an end? They trail Hoffenheim 1-0 thanks to Sebastian Rudy's strike just before half time. Nolito and Iago Aspas (yes Liverpool fans, you heard that right) are running rings around Barcelona's defence. This time, good combination by them ends with Hugo Mallo firing over from 20 yards. That's that for the first half. Every Celta touch is being greeted with a roar from the home fans. Surely they can't believe the way this match is going? Nothing lucky about this lead though - they deserve it. As it stands, Celta Vigo will be going top of La Liga. Real Madrid would move above them with a win at Bilbao though. Celta Vigo look as though they have got a third goal in them. Barcelona are absolutely shell shocked and I am not surprised - they have looked awful. What is going on here? Gerard Pique is horribly sloppy in possession. He is dispossessed by Nolito, who sends Iago Aspas through on goal. The ex-Liverpool man advances towards goal and cheekily dinks the ball into the net. Scenes. Barcelona may be top of the league with a 100% record but they haven't yet scored a first-half goal this season in La Liga. Fair to say they haven't started well tonight either. Brilliant from Nolito. The former Barcelona youth man collects the ball on the left edge of the penalty area, looks up and bends it into the far top corner. His fifth goal of the campaign and it is a stunner. Lionel Messi picks the ball up on the edge of the penalty area. He cuts inside but his low shot is blocked by a crowded penalty area. Barcelona are getting a grip on this now after a very shaky start. They are patiently passing the ball around in midfield and just waiting for their moment. Better from Barcelona. This time Luis Suarez gets on the end of a small through ball by Lionel Messi but his shot is again blocked by goalkeeper Sergio Alvarez. Barcelona have hardly been in the match but they are almost ahead. Andres Iniesta slips Lionel Messi through on goal and his first-time shot is beaten away by goalkeeper Sergio Alvarez. Not bad for a 32-year-old... Barcelona were 4-1 winners but the defender is being made to look silly early by a skilful Nolito. Barcelona can't get out of their own half. It is all Celta and Iago Aspas is inches away from going clear on goal. Good stretched clearance from Gerard Pique. Celta Vigo are the dominant force early on. In-form midfielder Nolito wants to get on the ball at every opportunity and Barca are looking a little sloppy. Bright start from Celta but what is former Liverpool man Iago Aspas doing there? The forward is clear down the left channel but from just inside the penalty area he drags a cross wildly across goal. Should do better. The Celta fans are in full voice, the scarves are raised, and the teams are out. This has the makings of a cracker. Five minutes away from kick off and the atmosphere is building in Vigo. Don't forget Celta beat Barca in the Camp Nou last season and are unbeaten this time round. This time last season Jurgen Klopp's Borussia Dortmund were stuck in a relegation scrap. This campaign, they have won all 11 games since new coach Thomas Tuchel was appointed - a club record winning run. A win at home to Mainz tonight could lift them back above Bayern Munich to top spot. Defending champions Paris St-Germain stretched their unbeaten run at the top of Ligue 1 to four points with a 3-0 win over Guingamp on Tuesday. It looks ominous for their rivals as Zlatan Ibrahimovic finally bagged his first for the season and former Manchester United man Angel Di Maria netted his maiden goal in France. But Rennes and St Etienne can both trim PSG's lead back to a point as they visit Gazelec Ajaccio and Troyes - most games are already underway..
Inter Milan haven't won Serie A since 2010 but, whisper it quietly, could this be their year? Roberto Mancini's men have a 100% league record and are eight points ahead of defending champions Juventus after four matches. Inter are at Verona tonight, with the Old Lady entertaining Frosinone. An hour after Barcelona kick off, Real Madrid will be underway in Bilbao and it could prove a landmark moment. Can they steal the show? Ronaldo and Messi aren't used to not being the centre of attention when it comes to goal records in Europe's top leagues. Tonight Messi's Barcelona travel to Celta Vigo looking to make it five wins out of five in La Liga, while Ronaldo's Real bid to retain their unbeaten start at Athletic Bilbao. The duo couldn't take the limelight away from Lewandowski... could they? Live coverage of both games - plus all the other happenings in Spain - coming right here. Barcelona XI: Ter Stegen; Alves, Piqué, Mascherano, Mathieu; Busquets, S. Roberto, Iniesta; Messi, Suarez, Neymar. Celta Vigo will not be anyone's mugs. Os Celticos are just two points behind Barcelona, having won three and drawn of their first four league matches of the campaign. Plenty of top European action going on and I want you to be a big part of it. Get involved via #bbceurofooty, post on the BBC Sport Facebook page or text 81111. Let us know your thoughts on any of the action. Hello and, yes, 24 hours on and Bayern Munich's Robert Lewandowski is still very much the talk of Europe. The Pole broke all sorts of records as he banged in five goals in nine second half minutes, having come on as a substitute, to help Bayern come from behind to beat Wolfsburg and retain their 100% Bundesliga start. It was the fastest five-goal haul in a major European league since Opta started recording stats. "Hey Cristiano/ Leo (delete as applicable), did you see what did Robert Lewandowski last night?" "What's that? Oh, scoring five goals? So what, we've all done that haven't we?" "Not in nine minutes you haven't..."
"Nine minutes you say? Right, who have we got tomorrow?..."